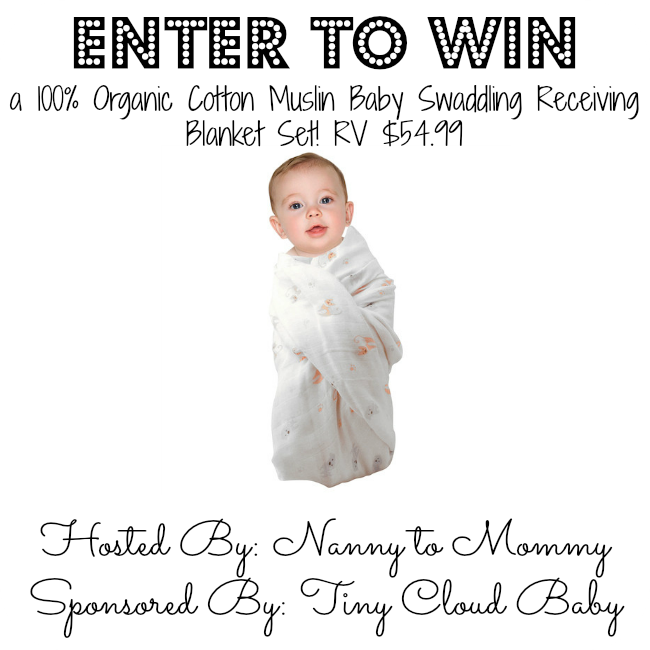 I am very excited to be sharing about my experience with Tiny Cloud 100% Organic Muslin Swaddling Receiving Blankets and the chance for one lucky Nanny to Mommy reader to win a set of 3 valued at $54.99! I received a complimentary set to review for my Baby Shower Gift Guide and I have to say that I am in love. 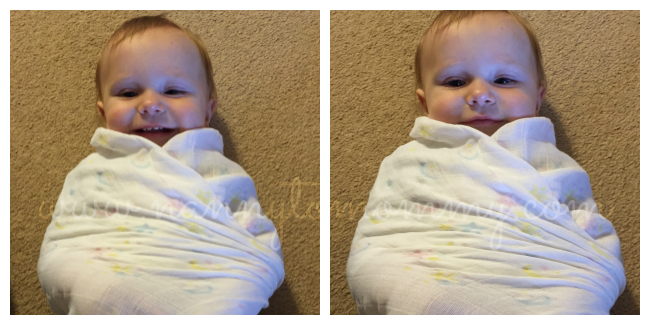 What is a muslin swaddling blanket? Muslin blankets typically come in a package of 3 blankets and are sized 44x44 inches or larger. The size is key - a baby cannot be swaddled properly in a tiny receiving blanket! That's why I love these muslin swaddling blankets by Tiny Cloud, they are a GENEROUS 47x47 inches! PLUS muslin blankets are very versatile. - Swaddle: The muslin stretches enough to wrap around the baby, but remains tight to hold securely. You can find videos online with tips on how to swaddle. - Sunshade: You can drape the blanket over your infant car seat or stroller to keep the sun off, even in Georgia heat, because the muslin is breathable and light weight. Perfect for the (hopefully) warm weather coming up soon. - Nursing cover: Place it over both of you to nurse. If a nursing cover is your thing, then a muslin blanket can come in handy. - Tummy Time Blanket: Throw it on the floor when you’re at someone’s house and let the baby crawl around safely. - Burp cloth: Yup, I went there. And it works. I love the neutral design of these because they make a GREAT baby shower gift and if you aren't finding out the gender or are like me and use hand-me-downs neutral is the way to go. The great thing about any muslin blanket is that they get even softer with each and every wash.
Buy Now and save 20% Off with Code: FWAKFVNT or Enter to WIN! Entry is simple! Follow the prompts on the Rafflecopter below. Open to US only, must be 18+ to enter. All winning entries are verified. Don't forget to check out my other fun giveaways and good luck! DISCLOSURE: Mama Smith’s Review Blog and Women and Their Pretties are not responsible for any of the prize fulfillment. Each blogger is responsible for providing their sponsor with their winner’s contact information. Winner will receive a code for 100% off their order. Shipping charges may apply. I would give this to my grandbaby. She could use it. I would keep these since we have a baby due in October. I am currently expecting my first, due May 1st! I'd love to be able to use this with my daughter when she arrives! This could almost make me want to have another one. Very almost. I would give this to my niece who is due with her first baby this year. I would give this to my daughter's mother as a gift. She just had another baby and I'm sure she'd love it. I have a friend expecting in August and would give this to her. We plan to start TTC soon, so I would love to win these for our future LO! I have a new little grandson. I would use these for him. I'd like to use this for our new baby. I would give this to my friend who just had a baby. Very useful! I would give this to a cousin that is expecting. I would keep this for our baby due in April. I would give this to my oldest granddaughter. She is pregnant for her first baby soon!! Both of my sister-in-laws are pregnant, so I would have to split it between the two :) Or maybe give it to my younger sister-in-law who is having her first in July. I have a good friends daughter that is expecting and I would love to give this to her. Thank you for te chance. I would use this with my one month old son. He loves being swaddled! I'd keep this for myself. I'm due in August. Thank you! I would give this to my newest grandson who will be born in may. I would like to win so he would have swaddle blanket. I have a family member that is due late Summer, so I would give it to her for her little one. I would keep it for baby #2. I'd keep this for myself. I'm expecting soon so this is much needed! I just found out my friend's daughter is expecting. I would love to give these to her. This is a wonderful blanket and a great opportunity to win one. The mother-to-be will be the recipient and I am sure will be delighted. I would keep this for myself. I am due in 3 weeks and only have one swaddling blanket. From what I've read it would be really handy to have more than one! I would give it to my pregnant friend. I would definitely give this to my best friend if I won. She is expecting and this would make a lovely gift. This would be for a friend :) I would love to win this for their baby shower :) Thank you! I would love to win this for my friend and her baby girl. I might add this to my own stash. I would love to use these for my little guy. I would love to win these for my little guy. I would give this to my daughter for my grandson. She will be having him on Monday. I would give this to my sister who is trying for her rainbow baby now. I'd like to win this for a baby shower. I would love to save this for my future kids. We are hoping soon. I am due with a baby in May, I would keep this for him! A good friend of mine is due with her first child, I would give this to her as part of her baby shower gift. These are very nice blankets! If I won, I would give this to my sister - she is expecting her first child soon. I would keep it for myself for when I have a baby. I would give them to my sister who is expecting a baby! I would love to win this for a friend of mine who is expecting. She is due in 2 weeks! I would save these for a friend. Thanks for the chance. I would give this to my daughter. She is expecting her first child. my sister is hoping to adopt a little one very soon and this would be great for her! she can use all the blessings she can get. I just found out I'm going to be a grandmother in October. I'd love these for the baby. I would use this on my new baby. I would save this blanket for my first-born. I would save this for my next child that we are planning on having. I'd love to win this for my brother and sis-in-law. They just found out they're pregnant with their first and they'll need swaddle blankets! I would love to win in order to give it to my sister who is expecting their first child. I would love to win this. i would give it to my daughter for her new baby. I would like to win this for myself. Our first baby is arriving next month! I want to win this so I can give it to my granddaughter thats 1 month old. Who would you give this to if you won >> I'd give it to my daughter in law for my grandbaby boy Hudson. I would love it for my baby. I would love to give this to my brother's wife who is expecting a baby. I'd like these for our next baby. He'll be our first hot weather baby and all our swaddle blankets will be too warm for him. I would like to win so I can use this for my baby! I would love this for myself. We are expecting in September. I would love to win this for my sister in law. She is expecting in May. I would like to win because I am having a baby in June! I'd like these for myself because I'm expecting. I would like to win because this is a product I used myself and I would like to give it to my pregnant friend so she can use one too! I would give this to a friend who is expecting a baby any day now. I would like to win to have these in my "grandma closet"! I would love to win this for my sister who is due in May with a little girl, thanks for hosting a wonderful giveaway! I would give this to my first great-grandchild due soon! I want to win these for my daughter, she is expecting her first baby in June and she could really use them. I would give this to my friend who just had a baby. I would give this to my niece that is expecting in July. I would give this to my daughter for my newest grandbaby. These are so useful. I used them on my own babies. I would keep these to use with our new baby girl due in July. I would love to win this for my cousin who is expecting in July! I would love to win for her because she was not ready for this pregnancy and just gave all her baby stuff away right before she found out she was expecting. I would give this to my cousin who is expecting her baby this week. This will be a great gift. I would give it to my best friend at her baby shower. I would like to win so I could give it to her. I'd give this to my friend, whose baby is due in May. I would love to give this to a close friend. She is due in the middle of May. I would be giving the blankets to our new granddaughter in April. I'd keep it for my baby. I would keep them for myself. I keep a couple of infants with a Mom in the military. Both like to be swaddled. If I won I would give this to my sister-in-law. This would be for Big Earl; he would look adorable in this! I would like to give this to my sister-in-law. She is due in July. I think these would make a great baby shower gift! I would keep this actually! I can always use more muslin blankets. My friends just had a grandson & the baby lives with them so this would be great for them! I would gift these to my daughter who is due with her first in May. I know a lot of mommies who are expecting and I could give this to any one of them. Large muslin swaddles are an absolute MUST have in my opinion! If I won I would be giving it to my new little grandbaby we are going to have in November. I am so excited it is our first! I'd keep it for my little one. Hopefully he/she doesn't mind being swaddled. My second child didn't like it. I would either keep them for my coming baby, or give them to a friend who is expecting! My sister who is going to have her first baby soon. I would use it for myself :) I am expecting my second little girl in 8 weeks! Thank you for the giveaway! I would like this for my family because I think that they are great! These would be for my new grandbaby coming in August. My family could use it. I think it's a great product. I would give this to my sister if I were to win. She would love it for my soon to be born new niece or nephew! This would be great for a good friend of mine who is due next month with her first. My best friend just gave birth to her first baby. I would love to win this to give to her. My toddler loves snuggling with blankets. He is always carrying one around the house. I would give it to my neice for her expected baby.